I’ve said it before many times in my articles about not knowing what’s on our campus until you dig deep enough into our campus soil, than you can see just how deep the roots are. Did you know we have our own Space Center on campus? 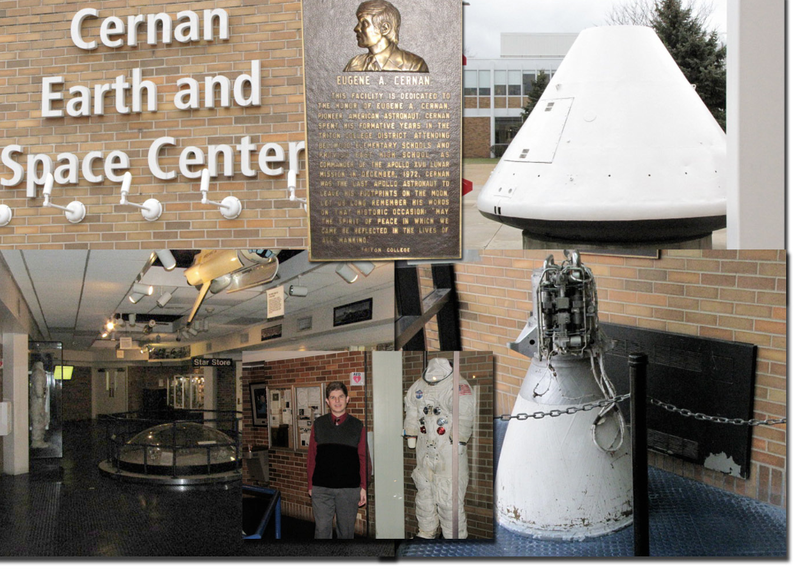 The Cernan Center is a public planetarium on the campus of Triton College in the Chicago suburb of River Grove. Its Web site, the Cernan Earth and Space Center Online (http://www.triton.edu/cernan), provides information for anyone planning to visit our planetarium. This includes a list of current shows, a description of all shows and exhibits, workshops for educators, membership information and much more. In addition to Chicago-area residents, the Cernan Earth and Space Center Online also serves people throughout the country and around the world. Online visitors can observe the current sky and moon phase, find out which planets are visible, shop for unique gifts in our Star Store Online, obtain biographical information about Apollo astronaut Eugene Cernan (the last man on the moon) and then jump to other exciting Web sites from our ‘links’ pages, which offer annotated and sorted listings. The Cernan Earth and Space Center’s office hours are Mondays, Tuesdays, Wednesdays and Thursdays from 9 a.m. to 5 p.m.; Fridays from 9 a.m. to 4 p.m. and 6:30 to 9:30 p.m.; Saturdays from 6:30 to 9:30 p.m.; and Sundays from 1:30 to 4:30 p.m.
STAR STORE HOURS: The Cernan Earth and Space Center’s Star Store gift shop hours are Mondays, Tuesdays, Wednesdays and Thursdays from 9 a.m. to 4 p.m.; Fridays from 9 a.m. to 1 p.m. and 6:30 to 9:30 p.m.; Saturdays from 6:30 to 9:30 p.m.; and Sundays from 1:30 to 4:30 p.m.
FOR EVERYONE: The Cernan Center is not open Monday through Thursday evenings, Saturday mornings or afternoons, or Sunday evenings. For the general public, the Cernan Center offers regularly scheduled Earth and sky shows, children’s shows and laser light shows. A new public program premieres approximately seven times a year. In addition to the regular programs, the Cernan Center also has a series of Monthly Skywatch programs that keep people abreast of the rapid changes in astronomy and space science while providing an opportunity to observe the moon and planets through telescopes set up on the lawn outside the building. Periodically, the Cernan Center also hosts special events, lectures and workshops that complement programs presented in the dome theater. For school groups of elementary and high school aged students, the Cernan Center provides an important extension to subjects already presented in the classroom. Teachers can schedule their classes to see their choice of program(s) at the time and date most convenient for them. For Triton College instructors, the Cernan Center’s variety of programs provide unique educational opportunities for many subjects and disciplines. Astronomy instructors use the dome theater to present special lectures in astronomy or to see any of our regular selection of planetarium programs. Geography instructors use the dome theater to give lessons in navigation that are easier to visualize than in the classroom. Programs also are regularly presented to English as a Second Language (ESL) classes that use the planetarium programs to improve basic language skills. Having the personal experience of going in the Cernan Center I must go take in a show as soon as possible it’s free for our Triton students as long as you are a student here at the college. For current show information, please go to http://www.triton.edu/Current-Public-Show-Schedule/ or call the Cernan Center Program Line at (708) 583-3100.